Like the beautiful, radiant stars in the night sky, this keepsake is a constant reminder that our loved one is radiating happiness down upon us from heaven. 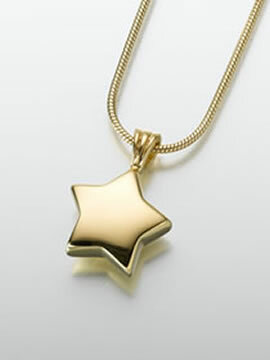 The Star Keepsake Urn is available in Sterling Silver or Gold Vermeil. The star measures 1" tall and 3/4" wide. It has a screw in the middle of the back for loading cremains. A small funnel, filling instructions, care card, and gift box are included. Engraving is available only for the FRONT of the star for an additional fee. We can engrave two lines with no more than 8-10 spaces per line. Please allow one business day for engraving. Non-engraved items usually ships same business day if order is placed by noon Eastern Time. Ships from the Midwest.